Easy Thanksgiving Starters - All Plant based and All Easy! We are starting new traditions! A delicious plant based Thanksgiving dinner that everyone will love! Here are a couple of starters that can be served for a casual dinner or can be adapted to serve a large group of your friends and family. - In a large stockpot heat oil and add onion and cook for 3-4 minutes. Then add ginger, garlic and spices. Cook over medium heat until onions are soft – about 4-5 minutes. - Add stock and pumpkin puree. Increase temperature and bring to a boil, then reduce heat, cover and cook for about 15 minutes. - Stir in coconut milk and cook for another two minutes. - Top with toasted pumpkin and pomegranate seeds. * If you are making your own pumpkin puree, cut your pumpkin in half, remove seeds and place cut side down in a microwavable container. Add about 1 cup of water and heat on high for about 15 minutes (or until soft). Cool and then puree in a blender or food processor. This salad is easy to put together and you can change it up and add your fav ingredients. Also, use a bottled vegan salad dressing if you are in a hurry. - Mix all ingredients together is a container with a lid - shake well before dressing the salad. - Combine spinach, cranberries, oranges, onion and pumpkin seeds and toss with salad dressing. Here is a classic vegan cornbread that is both delicious and very easy to make. 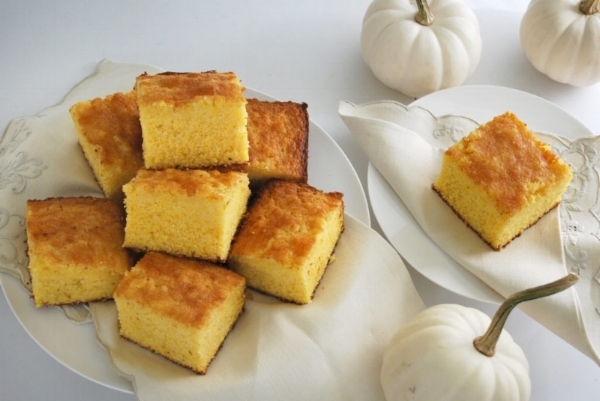 This recipe is dense and not too sweet, so if you like your corn bread sweet, just increase the maple syrup. - Preheat oven to 350 degrees Fahrenheit. - Whisk together milk, coconut oil, vinegar and maple syrup in a large bowl. Taste and add more maple syrup if you like it sweeter. - Combine all dry ingredient and mix well, then add to wet ingredients and stir until combined. - Pour the mixture into an 8 x 8 pan lined with parchment paper, and cook for about 30-35 minutes, or until top is golden brown. Start A New Tradition - A Plant Based Thanksgiving! Over 70 million turkeys are killed in the US and Canada each year - just for Thanksgiving! The conditions they are placed in while they await death, are abhorrent! We need to end this now. This year, I am going to inspire you to start a new Thanksgiving tradition! A plant based feast that will be the talk of all your friends and family. The first of our vegan recipes will be some appetizers and snacks. And as always, feel free to switch up the recipes to suite the ingredients in your cupboard and your taste. If you don't have time to make up your own appetizers, the stores are filled with some great options like hummus, veggies and dip, vegan cheeses and more! - Heat the oven to 350 Fahrenheit and line a baking pan with parchment paper. - Toss all ingredients really well and add to baking pan in a single layer. - Cook for about 6-7 minutes. Allow them to cool slightly before serving. Store in airtight container. These sweet potato crescent rolls are easy peasy and taste amazing. You can make the filling up a head of time and bake when you are ready to serve. - Add oil, mushrooms, onions, salt and pepper to a frying pan over medium heat and cook for about 5-6 minutes. Set aside. - Add cooked sweet potatoes, milk, butter and spices to a large bowl and mix well. - Separate the dough into 8 pre-cut pieces. - Spoon 1 1/2 Tbsp of the potato mixture and the mushroom mixture onto the large end of the dough and roll the pastry starting at the long end. Place on a parchment lined baking sheet (or an oiled baking sheet). - Cook for about 10-12 minutes or until slightly browned. This easy and delicious dip can be served with raw veggies, crackers or even some fresh baked bread. If you don't have white beans on hand, you can replace with most types of caned beans. - Place all ingredients into a blender or food processor and blend until smooth. - OPTIONAL: top with a splash of olive oil and chopped parsley.